You are here: Home / Guide / How to pay for a VPN anonymously with a prepaid debit card. How to pay for a VPN anonymously with a prepaid debit card. Some VPN users would like the option to pay for their VPN anonymously, but Bitcoin payments have a big learning curve, and it’s intimidating for people that have never used it before. And even then, not all VPN providers accept bitcoin. But fear not. There’s any easier way to pay anonymously, and it’s virtually untraceable if you want it to be. And you can pick up this amazing payment device at your local pharmacy, Target, or grocery store. These prepaid cards can be bought with cash (untraceable) and used just like credit cards to buy almost anything online, including VPN service. Some people have reported their prepaid cards getting declined for online purchases, but that’s because they didn’t know the one simple trick that will make sure your payment is processed correctly every time. We recommend using the OneVanilla prepaid VISA card, as they’re available almost everywhere (at least in the USA) and they can easily be loaded with any amount from $20-$500. They can even be used for recurring VPN subscriptions (until your prepaid balance runs out). A prepaid debit card functions almost exactly like a credit card. In fact, many of them don’t require a PIN number to use, you can just run them as credit anywhere that debit cards are accepted. But instead of linking these cards to a bank account or paying a bill every month (like a credit card) you just purchase these cards with a specific spending balance already loaded on the card ($50, $100, $200 etc…). There are two types of prepaid cards: Reloadable, and non-reloadable/gift-cards. The reloadable cards require ID and an SSN to sign up, but the non-reloadable/gift style cards don’t require any personal identification and can be paid with cash for totally anonymous transactions. Most major pharmacy chains have an entire display rack of prepaid and gift cards. They’re also sold at some supermarket chains, and even big-box stores like Target and Walmart. Which prepaid card to choose? We highly recommend the OneVanilla flexible-load gift card. The main reason, is the OneVanilla website actually lets you assign a billing zip-code to the card (using their web portal). This allows the card to pass the fraud checks of most online retailers, where other cards would get rejected. You can use any zip code you want, and no proof of address (or billing address) is required. You can also use whatever name you want during online checkout. Main Takeaway: Use the OneVanilla prepaid VISA, because you’ll need to assign a zip code to your card to shop online. This should be a no-brainer. If you pay with credit, there will be a direct connection linking you to the account number of the prepaid card you purchased. Cash is still untraceable (or practically so). Many locations (like CVS) only take cash payments for the OneVanilla anyway (to prevent chargeback fraud). 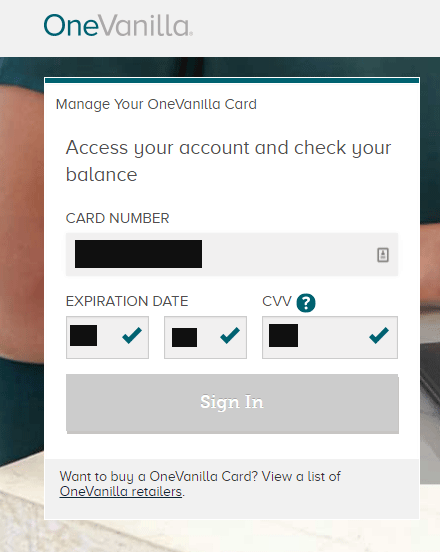 The awesome thing about the OneVanilla card is the OneVanilla.com website lets you add a zip code to your card without requiring any additional personal information. This allows you to use the card for most online transactions. Use a VPN (preferably zero-log). You login to the web portal by entering your CC number, expiration date, and security code (3 digits on the back). There is no verification of any kind (other than that it must be a real zip code). You can use any zip you want, from any state. Heck, be fancy and choose 90210 (Beverly Hills, CA). Click ‘Save’ and you’re all set. The card is now ready to shop online. We recommend IPVanish or Private Internet Access if you’re looking for a high quality VPN provider. They’re our two top rated VPNs, and have a history of excellent, secure service. IPVanish is one of the world’s fastest VPNs, and a true zero-log provider. PIA is also zero-log, and an amazing value at $3.33/month. It’s not quite as fast as IPVanish, and it’s software isn’t as polished, but it’s still the best bang-for-your-buck of any cheap VPN. 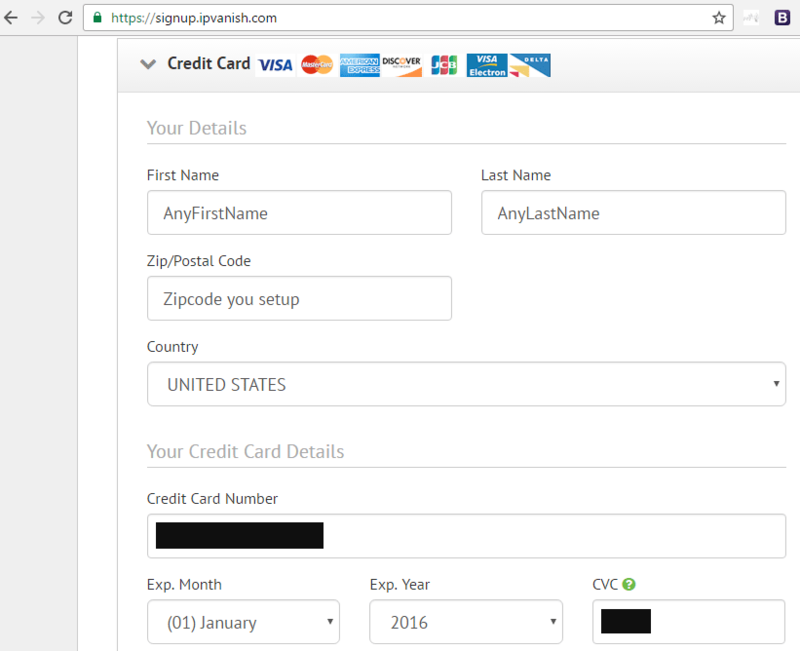 The awesome thing about IPVanish, is they don’t even require a billing address for credit card payments. Just a zip code (which you’ve got!). If you want to pay for a service that does require an address, you can just use any address in the zip code you chose. Go to IPVanish.com (or your chosen provider’s) website using the same anonymous IP method from step #1 before. Note: sometimes credit card payments via Tor IP addresses get flagged and declined, so you may wish to just use a public wifi network to avoid the hassle. First enter your email address (make sure to use a VALID email, because this is how they send you your password. You create a new email account just for your VPN subscription if you want). Then choose ‘Credit Card’ as the payment method. Note: You can use literally any first/last name combination for the billing information. It doesn’t matter. Just make sure to enter the billing zip code you setup in the previous step. Obviously the credit card number, expiration, and CVC code must exactly match your card. Your VPN password will be emailed to you within 10 minutes (usually sooner). It’s recommended you change your password to something other than the initial password, to something you can remember (and isn’t just sitting around in your email account). Which card are you referring to? And have you tried it without entering a zip code?